USEA and NEA are hosting a training for all Para Educators. Para Educators are essential in the education of our students. This professional development is offered FREE to all USEA members and a $20 fee for non members. Please look at the flyer below for more information. 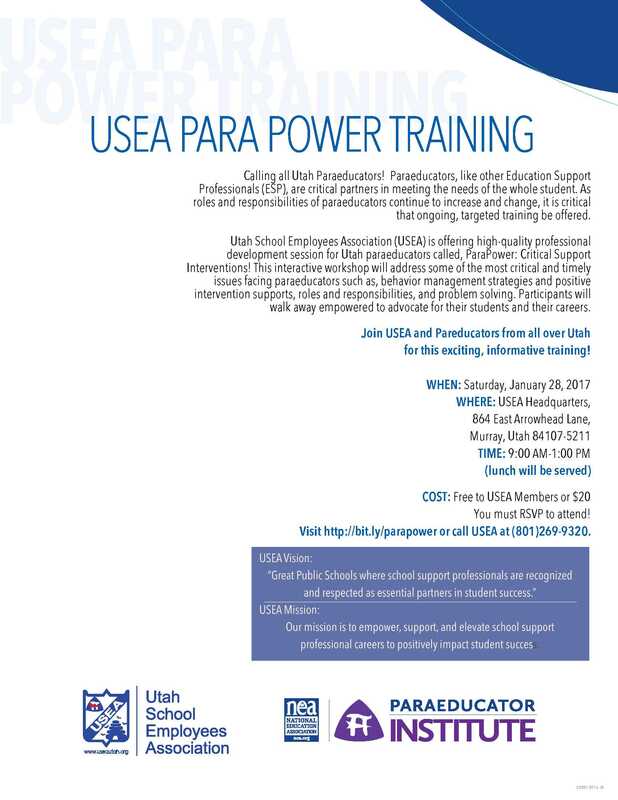 RSVP at http://www.bit.ly/parapower or call USEA at (801)296-9320. USEA and NEA are hosting a Para Power training on October 8th. There are only 80 slots available so anyone interested in attending will need to RSVP at Visit http://bit.ly/parapower or call USEA at (801)269-9320. This is a free training for member or non member. Please come, and invite a coworker. Light Breakfast and hot lunch will be provided. See the flyer below for more information. The negotiated agreement for this next school year is up on our site. Thank you to all of you who came to our planning meeting as well as our mass meeting. Negotiations went well this year and there were many positive things that came from it. A special thanks to the negotiation team for all their hard work to get this accomplished. 1) Displaced families are to still come to West Elementary and check-in with the Red Cross. 2) The Tooele Fire-Relief Fund has been established for donations. A donation can be made at any Zions Bank. 3) For all other donations (food, clothes, etc.) go to www.TCEM.org for designated donation sites.